Thanksgiving is right around the corner! Are you excited for Aunt Carol’s green bean casserole & Uncle Steve’s “famous” (dry!) stuffing? Yeah… we didn’t think so. The holidays are that time of year all your family gathers in one room; that is a feeling one could never live without. It’s about as much fun as the noogies & wet willies from Cousin Frankie. Last year on Instagram you saw awesome pictures from someone’s party hashtagged “Friendsgiving” … but what is it? Friendsgiving is a time when you get to choose to spend the classic holiday with your friends, or have a secondary feast. 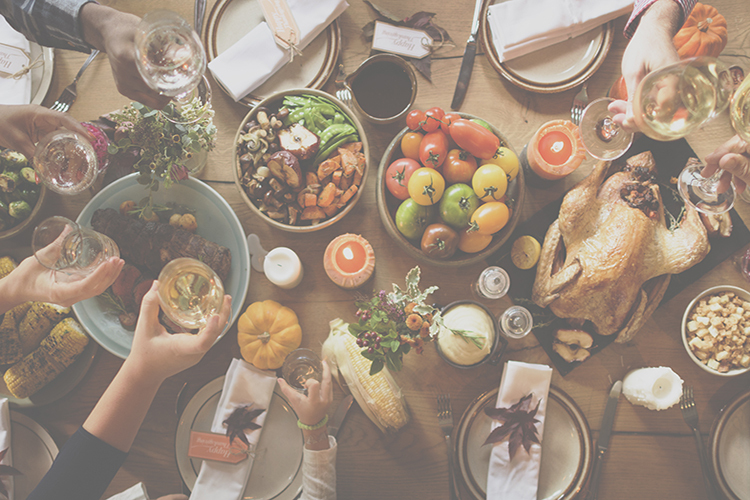 Friendsgiving has become more and more popular over the years, where and how it started is unconfirmed, but there are plenty of reasons to celebrate. Whether you have to miss (read: skip) Thanksgiving with your family or want another reason to have a glass of wine with good friends, Friendsgiving is a must! Whatever the reason may be, this is your opportunity to hang out with your “chosen family” through good food, drinks, and music. When it comes to Friendsgiving there are no rules, so you don’t have to stick to your traditional dishes! This can be your time to try that deep fried sriracha turkey, sweet potato and cranberry quinoa, or even those gluten free biscuits. The sky is the limit! If your culinary talents are non-existent, there is no shame in calling your favorite caterer for some help. It’s all about the fun in getting together with the family that you got to pick yourself. Now it’s time to get organized… putting together your guest list is the easy part. Pick a date and rally up the friends that want to have a good time. Next, decide who is bringing what. Everyone needs to contribute! Make sure your friends each pick something to bring to ensure everything doesn’t fall onto the plate of the host. Use our super handy checklist to designate what each person is responsible for and to take the guesswork out of what you will need! For the food, you can either openly assign each friend a type of dish, or just have them run it by you before the big night. This is the best way to avoid duplicates. If you have that friend who can’t even microwave popcorn, let our Events and Cuisine team help! Have a vegan friend who can’t eat much? Put them in charge of the vegetables. They will have a slamming recipe that brings the veggies to the next level, it’s the main thing that they eat. What would any thanksgiving celebration be without stuffing! A killer playlist is a must! The music will set the tone for your Friendsgiving and setting up while listening to some great music will definitely help make it that much easier. We’ve taken the hassle of putting a playlist together out of your hands! 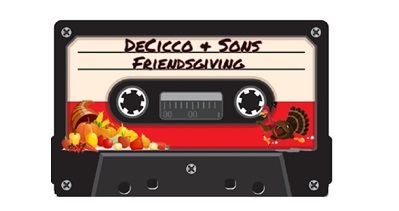 Check out our Spotify playlist specially curated by us for your Friendsgiving! Just make sure one of your guests brings some speakers. Lastly this night is all about fun! You will need some type of entertainment… now now, let’s get our heads out of the gutter, talking about games here! Adding fun, new, and exciting games not only adds to the excitement and helps keep the small talk to a minimum, but is a great opportunity for some social media worthy snapshots. Some of our favorites include Heads Up, Speak Out, and Cards Against Humanity… trust us the laughs will not stop. 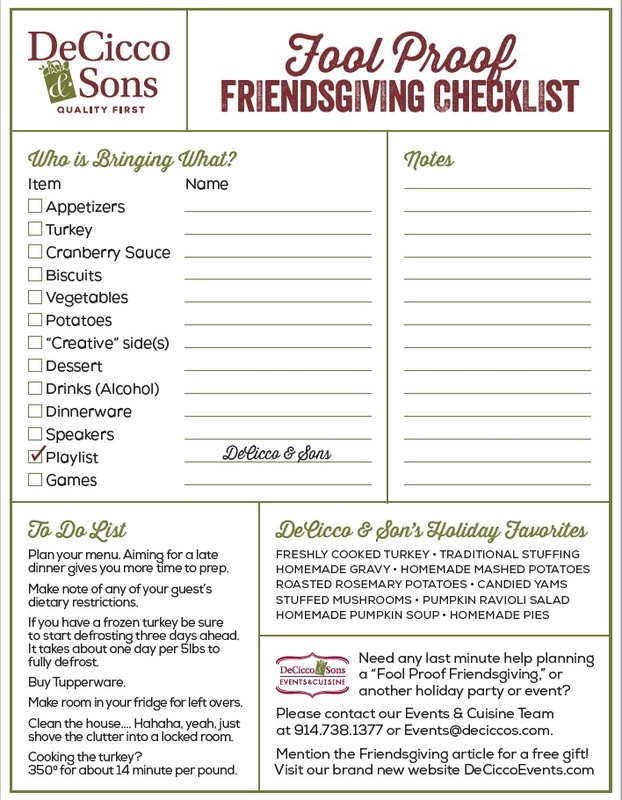 Now you have all the tools to execute a memorable Friendsgiving! We are looking forward to seeing how much fun you and your friends have, feel free to tag us on instagram and use our Friendsgiving hashtag #FoolProofFriendsgiving. Remember, if you need any help The DeCicco & Sons Team is always there for you!